..do not waste your time, do it NOW! Analyze the product drawing and design, the preceding fabrications steps and the available fixturing devicces. Get better results choosing the correct jig. For small scale productions or medium and big lot size. For fabrications in robotic cell as well as for manual welding. Need to free human resources? People from fabrication floor or people from the technical dept? Anyone is in charge for it, the design and manufacturing of welding jig is a task that requires time. And good specific skills. you just found a useful resource to accomplish your target. Before to start designing any part of the jig, of course, it is required to make a preliminary analysis of the piece to weld. In order to find as soon as possible which device is suitable depending on kind of product, lot size, existing facilities. The cost of the welding jig has wide price range depending on the result you want to obtain. Our team is ready to help you find out the better option. 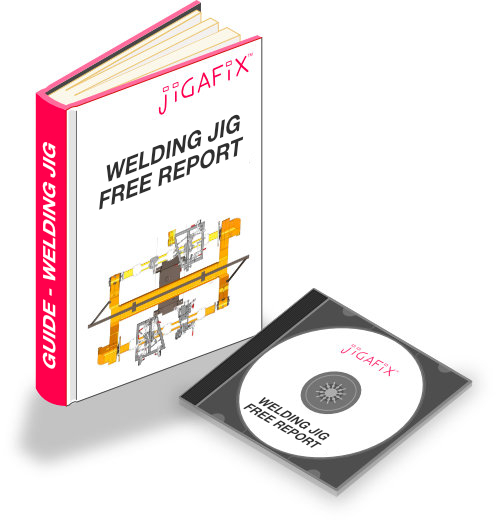 looking for the welding jig design that better fits your needs. existing plants (robot, positioners, ..) and your objectives..
After the most suitable solution was found, the design goes on keeping an active exchange of information between the "development team" and you. Agile during all the steps, in order to catch any new requirement that could grow anytime. Lasting constructions, manufactured with customized components. The required mechanical precision and tunability of the jig. To provide a device ready for starting the fabrication. From big jigs for heavy products to small jigs for laser welding. Welding is a hard job. Hard is keeping the welding gun all day long. You know it well. But there is just this way for welding some components. I saw my first welding jig in a workshop that I haunted when I was a student. It was a scrambled equipment, but I felt an emotion: the worker who made it was enjoying it, because it was saving him a lot of work. Devising new ways for allowing people to save time and hassle has been since then my purpose. I started developing and designing equipment sets for that, putting myself in the shoes of who will use it. Thanks to solving the worker's hassle I then learned that a lot of others benefits were achieved: more speed, precision, safety and health, better attitude, new ideas, new opportunities..
Today we are helping also product manager and process managers to achieve better results with less hassle. Because also the method that leads to the choice and design of the welding jig must be fast, organized, clear and interactive. Agile. Actually, I find myself also in shoes of the robot. It does not need to save efforts, but move fast and easy. But a human for mounting the assembly is still required. Always. I have more than fifteen years if experience on designing jigs and fixtures for welding and manufacturing products.  Quality means doing it right when no one is looking.  Costs do not exist to be calculated, costs exist to be reduced.  I get it! You have to just do it right away because you can not do it again! with a correct fixturing solution. From zero to over 100%*! *If you are fabricating by manual welding, the jump ahead is really huge. Allowing you to evaluate new requests from customers that you maybe are now skipping. For small, medium o big lot size..
For the robotic cell welding, using proper fixturing devices can help optimize the fabrication process. Of course, if you did a good preliminarly analysis. Contact us now for getting our evaluation and the quotation for your current welding job. Try the agile mechanical design. For developing your new product or the current fabrication process, joining the forces is the better way to solve the problem you are now facing. We are applying to mechanical design the system succesfully used by software developers. How? Sharing with you and your team all the related information. By our web platform. So, all the persons involved in the project can access any useful element, can add requirements or new ideas, to grow the better solution for the fabrication. Calculate before the duration of the production. Consider now the opportunity to introduce a welding jig for a product that you are manufacturing or for the next offer. Benefit from our agile development system! Interact actively, participate and get feedback during the development, until the commissioning of the equipment. Focus your internal resources to product design and to the manufacturing of your goods, where can create the real added value. In this video you will learn how a welding jig can improve the production time and quality: +100%. This is for a four element assembly. Can you imagine if the assembly is more complex? Get it with our FREE guide! start designing your tools with our team! We follow three basic steps. Of course, the first is the analysis of the welding job and the surroundings, based on your objectives. From the preliminary analysis we move to the manufacturing of the devices. Keeping a constant contact with you and your team long the way. Anything related with the project is kept accessible on our web platform. Well organized and safe, in just one container. Files, documents, messages..
Sending proposal and requests is easy and fast. No email back and forth! Contact us for the analysis of your assembly, happy to help! Product - Checking the parts of the assembly. To find out if it is possible to simplify the design, when applicable. Fabrication - Preliminary study of the process, the welding cell or the workbench. Looking for the more effective production cycle. Costs - Analysis of operations for allowing an estimation of the cost and ROI. 3D Modeling - Development of the analysis carried out before, building of the 3d models by software. Simulation - Simulation of the gestures performed by the operator or by the robot, for achieving the best performances. Drawings - Issue of the drawings required for the manufacturing of the welding jigs. Bills of materials and operational procedure. If required, drawings can be issued using your logo. Main frame - Careful crafting for the backbone of the equipment, suitable to carry the parts and resist to welding stresses. Components - We use the best component on the market or we design and manufacture ourselves, to assure precise and adjustable clamping. Tuning - Final touch of the masterly, to check that everything runs as planned. Saving your know-how is one of our priority. Any information provided is archived and shared in a safe way. Our team members share this value, which is a basic requirement for building a trust relation with you. Now you have a specialist at your service. We are working for you. Any information about your project is just one click away from you, so you can follow the development of your equipment and interact in any moment, from any place. and analyze any detail of everything? Cost of tools and devices not under control. Excessive dependence from the employee skills. Erratic quality of product, waste and reworks. Internal resources not focused on core tasks. Poor or useless information for decision making. Try to making it simple! We are here for helping you develop the proper equopment for manufacturing welded fabrications. FIll in the form to request a contact. I will contact you back to share information about you welded product and your requiremants. I will contact you to gather more details. You will receive an email with the link for downloading the guide.